Just another long time Swat Kats fan here. I've lurked for awhile, figure it's time I joined the forums. Saw this series when I was young and am thrilled to see the creators working on it getting a second chance. Hopefully it will! Thanks for joining! I really like the Tumblr you made - it's great to see everyone's contributions getting new life there. Everyone, Agracite's been quietly helping me present a Tumblr presence for almost a year now, allowing me to embed the feed on the swatkats.info homepage (which, ironically is currently down because Tumblr changed their API and I haven't had time to fix it yet). But, I don't mean to infer credit on my part - in actuality the Tumblr is all Agracite's doing. I need to add a fourth button to MegakatCity.com at the top and a link in the footer - been meaning to. Thanks for your work there, Agracite! Welcome to the forums! I hope that you will enjoy your stay with us. Heyo! Nice to see you here. 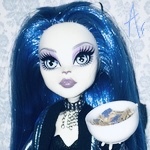 Welcome to Megakat City and thanks for posting some of my stuff on your tumblr, Agracite. If only we could have that in a larger resolution, someone could color it. It'd make a really awesome banner. Welcome to the Megakat City! Considering its origins, we're likely to never see it in a larger size. It's from Cartoon Network's old website and they didn't show the pictures any larger that I can recall. Does anyone know the fate of the stuff they had on there? Kooshmeister wrote: Considering its origins, we're likely to never see it in a larger size. It's from Cartoon Network's old website and they didn't show the pictures any larger that I can recall. Does anyone know the fate of the stuff they had on there? As for the original documents, there's probably an untouched filing cabinet somewhere no one has touched in years. Here's the Wayback Machine version. 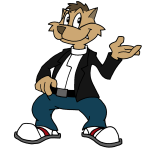 But, that's really slow, so I re-ripped everything (most of this probably already exists on swatkats.info). Here's a Gallery, or you you can just download everything. Chance Furlong and Jake Clawson appear to be a couple of ordinary junkyard auto mechanics until trouble occurs in Megakat City. In a flash they fly their high-tech Turbokat toward danger as T-Bone and Razor: the Swat Kats. 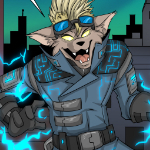 The city is run by the power-hungry Commander Feral and his Megakat Enforcers, a militant team of law officials. Jake and Chance were once Enforcers but Feral demoted them to working in the scrap yard, where the Swat Kats were born. Callie Briggs, the deputy mayor, contacts the Swat Kats whenever evil threatens. 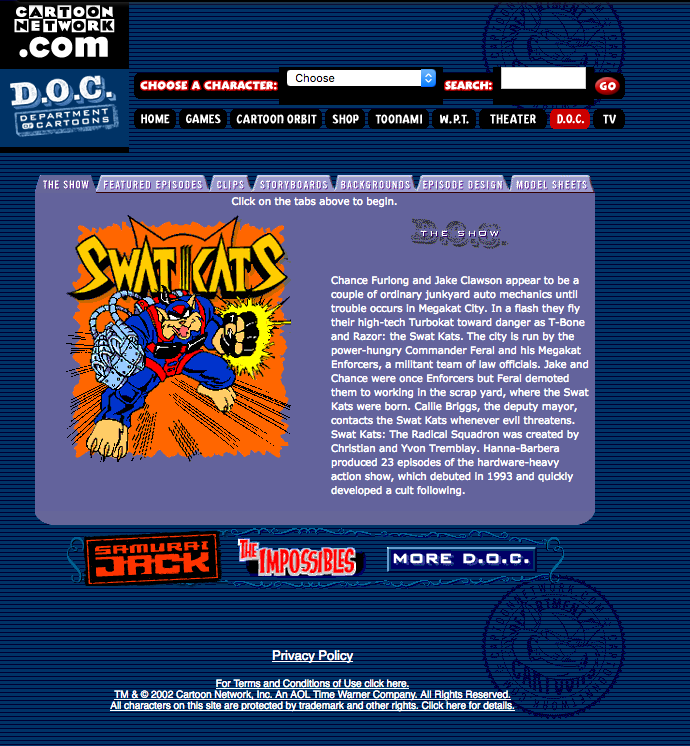 Swat Kats: The Radical Squadron was created by Christian and Yvon Tremblay. 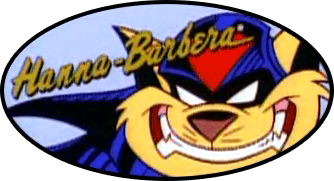 Hanna-Barbera produced 23 episodes of the hardware-heavy action show, which debuted in 1993 and quickly developed a cult following. The swamp-dwelling Dr. Viper turns his fellow evildoer Morbulus into a hulking bacteria blob. It attacks the city so that Dr. Viper can loot the Megakat Biochemical Lab. The Swat Kats seem unable to stop the Giant Bacteria since it divides into two anytime it is hit. Mac and Molly Mange are rubbed-out mobsters who are brought back to life as The Metallikats, robots created by the well-meaning Prof. Hackle. They vow to "tear up this town like a scratching post" and seek revenge against Mayor Manx for denying their parole. Mayhem ensues as the Swat Kats fly in to save both Manx and Callie from the reckless robots. 182-9303 "The Pastmaster Always Rings Twice"
When the evil Pastmaster is accidentally freed from his centuries-old imprisonment, he steals his "Tome of Time" spellbook from the Megakat City Museum of History and attempts to throw the city back into the Dark Ages. He creates a time vortex and brings dinosaurs back from the past to create a diversion. The Swat Kats try to respond, but they get knocked into the Prehistoric era themselves.